The Hindu tradition is having several deities which are symbolic or some particular aspect of the Supreme Divine. One such pious and powerful deity is Lord Hanuman also known as Pavanputra or Bajrangbali. Hanuman known also as Anjaneya, is one of the most important personalities in the epic, the Ramayana. Lord Hanuman was the son of the wind God. He was very strong and was a great devotee of Lord Rama. He helped lord Rama defeat the king of Lanka Ravan and get back Goddess Sita. 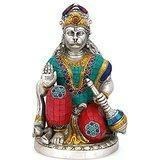 Size : 9 Inches Height X 5.5 Inches wide X 5 Inches depth , Weight : 3.2 Kg , Material : Brass,(Silver ,Gold Polish With Turquoise and other coral stone Handwork)...-------------- Pls beware from Copy product & ensure buying authentic product. This is exclusive inhouse design & product of Brand "Collectible India" and "covered by intellectual property rights laws". 'Collectible India' doesn t authorize any other Brand/Seller to sell it and we won't be responsible if any counterfeit or substandard product send by any other seller.